1.The fire department conducts an annual inspection intended to verify compliance with this section, or any required inspection. 2.When a change in use or occupancy has occurred. 1.Upon the entry door or sidelight at a minimum height of 42 inches (1067 mm) above the walking surface on the address side of the building or structure. 2.Upon the exterior surface of the building or structure on either side of the entry door, not more than 3 feet (76 mm) from the entrance door, at a minimum height of 42 inches (1067 mm) above the walking surface on the address side of the building or structure. 3.Conspicuously placed inside an enclosed entrance lobby, on any vertical surface within 10 feet (254 mm) of the entrance door at a minimum height of 42 inches (1067 mm) above the walking surface. 4.Inside the building’s fire command center. 5.On the exterior of the fire alarm control unit or on the wall immediately adjacent to the fire alarm control unit door where the alarm panel is located in the enclosed main lobby. 1.White reflective background with red letters. 3.Numerals shall be Roman or Latin numerals, as required, or alphabet letters. 4.Permanently affixed to the building or structure in an approved manner. The building information sign shall be a Maltese cross as shown in Figure J101.1.3. J101.1.4 Sign size and lettering. 1.The width and height shall be 6 inches by 6 inches (152 mm by 152 mm). 2.The height or width of each Maltese cross wing area shall be 11/8 inches (29 mm) and have a stroke width of 1/2 inch (13 mm). 3.The center of the Maltese cross, a circle or oval, shall be 3 inches (76 mm) in diameter and have a stroke width of 1/2 inch (6 mm). 4.All Roman numerals and alphabetic designations, shall be 11/4 inch (32 mm) height and have a stroke width of 1/4 inch (6 mm). Designations shall be made based upon the construction type, content, hazard, fire protection systems, life safety and occupancy. Where multiple designations occur within a classification category, the designation used shall be based on the greatest potential risk. J101.3 Construction type (top wing). J101.4 Fire protection systems (right wing). J101.5 Occupancy type (bottom wing). The occupancy of a building or structure shall be designated in accordance with the occupancy classification found in Section 302.1 of the International Building Code and the corresponding designation shall be placed in the bottom wing of the Maltese cross. Where a building or structure contains a mixture of uses and occupancies; all uses and occupancies shall be identified. J101.6 Hazards of content (left wing). 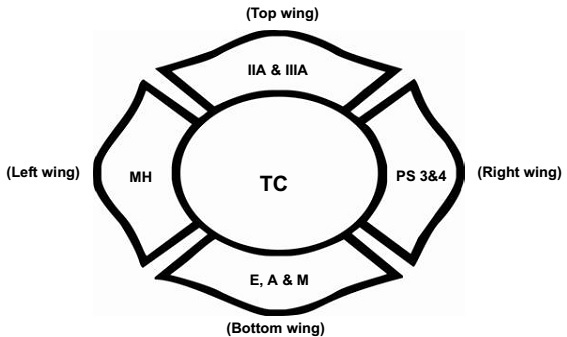 J101.7 Tactical considerations (center circle). 2.Impact-resistant glazing, such as blast or hurricane-type glass. 3.All types of roof and floor structural members including but not limited to post-tension concrete, bar joists, solid wood joists, rafters, trusses, cold-formed galvanized steel, I-joists and I-beams; green roof with vegetation, soil and plants. 4.Hazardous materials (explosives, chemicals, plastics, etc.). 5.Solar panels and DC electrical energy. 6.HVAC system; and smoke management system for pressurization and exhaust methods. 7.Other unique characteristic(s) within the building that are ranked according to a potential risk to occupants and fire fighters. J101.8 Sign classification maintenance, building information. 1.Fire departments in the jurisdiction shall define the designations to be placed within the sign. 2.Fire departments in the jurisdiction shall conduct annual inspections to verify compliance with this section of the code and shall notify the owner, or the owner’s agent, of any required updates to the sign in accordance with fire department designations and the owner, or the owner’s agent, shall comply within 30 days. 3.The owner of a building shall be responsible for the maintenance and updates to the sign in accordance with fire department designations. Jurisdictions shall train fire department personnel on Sections J101.1 through J101.9.